Australia may be the driest continent on Earth, but it is still home to some amazing biodiversity. The country's southwest corner is one region that is recognized as a global biodiversity "hotspot" with outstanding natural environments whose protection is essential. Think Australia and the Great Barrier Reef and the Outback quickly come to mind. But the often overlooked southwest corner is a region not to be missed. From the Swan coastal plain to the valleys around Perth, from the Esperance plains to the jarrah-karri eucalyptus forests, southwest Australia has the highest concentration of rare and endangered species on the entire continent. Here one finds more than 6,000 species of native plants and 100 native mammals, birds, frogs and reptiles, making the region a biodiversity "hotspot". The numbat (Myrmecobius fasciatus), quokka (Setonix brachyurus), western swamp tortoise (Pseudemydura umbrina) and Gilbert's potoroo (Potorous gilbertii) are just some of the endangered wildlife unique to region. Sea lions, southern right whales, great white sharks and many other marine species are found off the southwest coast in the waters of the Indian and Southern oceans. 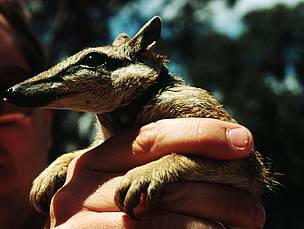 The numbat is a small marsupial endemic to Western Australia. Where is the Southwest Australia region? View all WWF Critical Regions of the World. Land clearing for agriculture remains the number one threat to the survival of animal and plant species in Australia, especially in the southwest. Logging, invasive species, salinity and climate change are also taking a serious toll on this fragile environment. WWF has joined forces with local communities, NGOs, research centres, business and government agencies to develop an ecoregional approach to biodiversity conservation in southwest Australia through a number of large-scale conservation projects and programmes. The Southwest Australia ecoregion covers approximately 48.9 million hectares (489,944 km2). Within the Southwest Australia Botanical Province, 6,759 plant species have been identified; almost half (3,620 species) are endemic to the province. Gilbert's potoroo is Australia's most endangered mammal, with fewer than 40 left in the wild. The karri is one of the largest trees on Earth, some growing as high as 80m. Nearly 90% of all eucalyptus woodlands have been cleared throughout southwest Australia. Much of southwest Australia has been the homeland for the Noongar (Nyoongar or Nyungar), Yamadji and Wongai peoples.